under the raedar: Toddlers, teens and yoofs - where are they? Toddlers, teens and yoofs - where are they? I've been doing some work on child poverty and social mobility recently, and part of this has involved looking at simple stats like the percentage of people in each area who are under 18. 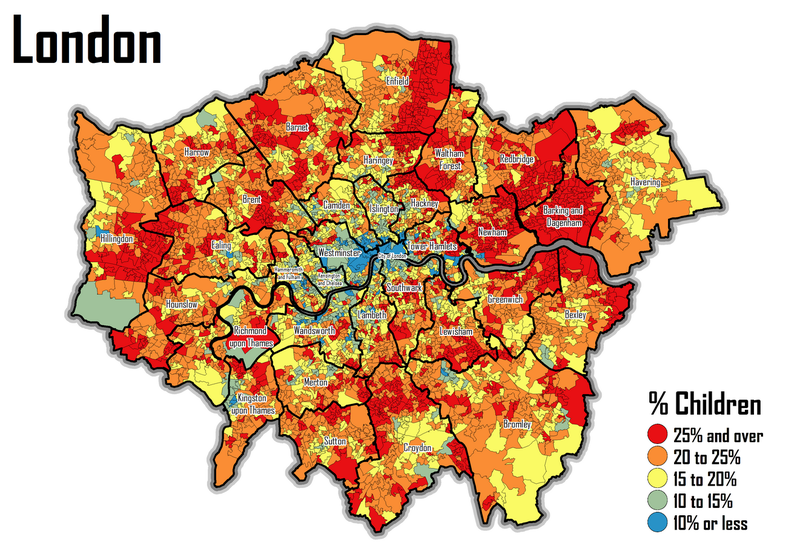 This has given me a better insight into which areas might be most affected by children's issues and policies. 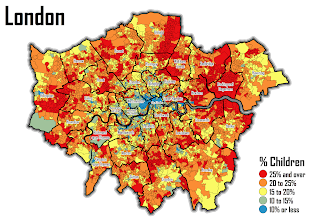 I've been looking across Great Britain but focusing on England and Wales and so I thought I'd just post a couple of maps showing the % of children across London Boroughs and the core cities - see below. The results are quite striking - and particularly interesting I think are the differences between and within the core cities. What is also very interesting is the spatial divides in terms of which areas have a high concentration of children and which don't. These data overlap with many other datasets - which is partly what I'm looking at in my research right now - but this post is simply about the two maps. One academic-related thought on this, though. I've been looking at the literature on neighbourhood effects over the past few years and following with interest the debate on where people 'choose' to live. This got me thinking about who might not get to choose, and children is one obvious group. As you can see from the maps there are large areas where 25% or more of the residents are children, and some areas where it is nearly 50%. Also interesting for me is the extent to which city centres in (e.g.) Liverpool, Birmingham, Manchester and Leeds are largely child-free - possibly linked to the concentration of students and new city centre living. Anyway, that's enough for now. Technical note: this is done at the lower super output area level and for the local authority boundaries of the English core cities, plus all of Greater London. The data are from 2011 Census table KS102EW.